Hey there fellow CBB Budgeteers! Welcome to the last budget 2014 update where I share an overview of just how good (or bad) Mrs. CBB and I managed our money. Even though the monthly budget update takes me a LONG time to put together I enjoy seeing our financial progress. In a way it’s forced attempt at dissecting our budget intent further because we choose to explain it to all of you. I always say to you that in order to know what you are doing with your money you need to track it because without a trail of numbers you’ll never know what you are capable of. This post is by far one my favourites to write each year because the budget overview is one of the last pages of our financial year. The critical part of this post is reviewing all the numbers to see if they worked for us and where we need to make improvements for the following year. As you will notice below in the chart we did need to make changes to our budget either because what we were budgeting wasn’t working or prices have gone up. Once I ran all the year-end budget 2014 numbers my wife and I sat down to check over our year. As you all know we paid our mortgage in full in early 2014 which REALLY helped us with our savings. Paying off the mortgage saved us around $1300 a month but don’t be fooled that money was put to work right away. Not having a mortgage was great but we knew as soon as the mortgage door was closed the money would be allocated towards our other investments some of which could use a boost. We opted for the balanced approach when it came to investing in retirement and paying off the mortgage and it worked for us. In 2014 we put $18, 949.96 away for our retirement a trend we hope to see continue. Another wonderful surprise in 2014 was the birth of our son. Even though my wife and I read endless articles about babies and how much they cost and how to prepare you never really appreciate it until you live it. If you are a parent you know exactly what I’m talking about. Near the end of 2014 we put a lump sum down $2500 into his RESP and starting in January 2015 we will be paying just enough to get the government matching of the program for his education. Renovations in 2014 saw me finish the front landscaping (finally) although I have to say I need to install the spotlights but that’s easy. I also purchased lots of materials for both of our bathroom renovations with the en-suite getting an entire gut and makeover. I’m still working on this project and now the wife is talking about finishing the basement for baby to have somewhere to hang out and play, neat. Me and my big mouth saying that I wanted a house to finish on my own.i did at the time when life was meh but now my career is in high gear and baby is here. Time, what is time? I may have to deal with the fact that at some point I may have to just hire someone to help me even though I didn’t want to unless it was something I was unable or not skilled to do. Oh well, time with my family is more important. In the end the renovations caused our budget to jump sky-high although we do save in projected expenses for home maintenance and renovations every month. Another huge hit to our budget was the almost $4000 we spent on our amazingly soft new bed and attributed to the miscellaneous category to blow up at $7994.82 in 2014. I know it seems like lots of money but have you seen the prices of mattresses these days? I’m not talking a cheapo mattress either I’m talking about one that actually works for our bodies and won’t sink in a year or two. There’s a time to be cheap and a time to save up to buy quality stuff. We didn’t want to buy a mattress because it was cheap we wanted quality and something that would last us years. Don’t get me wrong though for years we were using hand me downs from the family because affording a new mattress was simply NOT in our budget. At one point we were just using an air-mattress until we could get ourselves sorted. What a waste of money that was as it was a leaker with-in weeks. We did go all the way and pay to get remote controls for the bed which added to the cost but we won’t have to purchase them again. 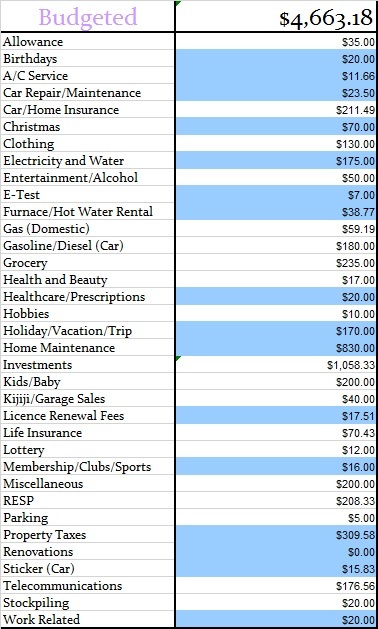 Other expenses that fell into the budget 2014 misc category were items that had no category or what we call “things and stuff” but stuff we needed. It’s near impossible to categorize everything in a budget unless you want the longest budget known to man. Our hobbies and health care/prescriptions took a bit of a hit in 2014 as we bought more prescriptions some of which were not covered in full by our benefits company. We also needed new running shoes and we bought some new equipment for the home gym such as large floor mats, weight bench and two machines second-hand. We don’t always have time to head to the gym so creating a home gym was imperative for us the past few years. Saying that now that baby CBB is here we’ve talked about getting a family membership to the local YMCA so we can take him swimming and participate in other programs. I’ll be looking more into our options soon as I’d like to get him in the pool with me to learn how to swim. There are also some free baby and toddler programs we will participate in over the next few months. Free is good! Surprisingly we didn’t spend our entire clothing budget but we aren’t the type who needs to keep filling up our closets with the latest and greatest. I have so many pairs of jeans, t-shirts, dress-shirts, hoodies etc. that I’ll be doing a clothing donation soon and so will the wife if I can break that clothing bond she has. Our grocery budget surprisingly came in under budget in 2014 $2788.36 but barely. To be honest we weren’t sure if we were going to make it and in October we declared the last two months of 2014 our $100 a month grocery shops. Even though some of you might think it’s a measly amount to budget it really is enough for us. Our reasoning is that it limits our options of buying any junk food or convenience foods we don’t need. When we know we have limited money we make it work for us to get only the essentials with a treat once in a while. Our monthly grocery budget for 3 is $235.00 while baby has his own category for all things baby related which can get pricey for us. Saying that he is coming up for 4 months and soon he will want to eat solids so we may see a small hike in our budget for food that we will have to deal with the frugal way. My wife and I plan to make our own baby food and we will have an upcoming blog post in 2015 to talk all about it. For 2015 budget we have changed our stockpile budget from $20 to $25 a month. If you want to join The Grocery Game Challenge 2015 it’s starting now! Take control of your grocery spending and post your budget and shops with the GGC family of fans. As you will see our car repair went far above what we projected in 2014 as we spent $717.66 instead of the budgeted $282.00. The reason for this was because we needed an unexpected brake job, door lock actuator repair, fan belt replaced, and a new battery. We have changed this to $59.00 a month to be saved as a projected expense in 2015. If you don’t budget for repairs on your vehicle, think about it because whether you do the work yourself or pay a mechanic it’s pricey. Our parking category as you will see was $746.50 way above our budgeted amount as I have to pay for parking at my other job. Good ol GTA! Starting next year though I will pay for a full-year $479.00 which is cheaper than what I’ve done. I’ve only been contracted part-time not knowing what was around the corner but now it’s fair to say I know more. It was a case of why pay more for something you might not use. In the mean-time we are budgeting $45 a month to pay for that yearly parking pass and keeping the original $5 for the odd parking we pay when we have to go out. Being able to accurately guess what you will spend in each category is not easy and there may be years where you spend more or less depending on how your year unfolds. What we have done as you will see below for 2015 is review each category. I’ve added up every final number in each category for the year to see just how much we actually spent in comparison to what we were budgeting or expecting to spend. In the chart I’ve also shared with you what our new expense for each category will be for 2015 based on the 2014 numbers. I’m working on our budget so it automatically tallies up the categories month after month so we can see how we are doing rather than having to manually calculate it. 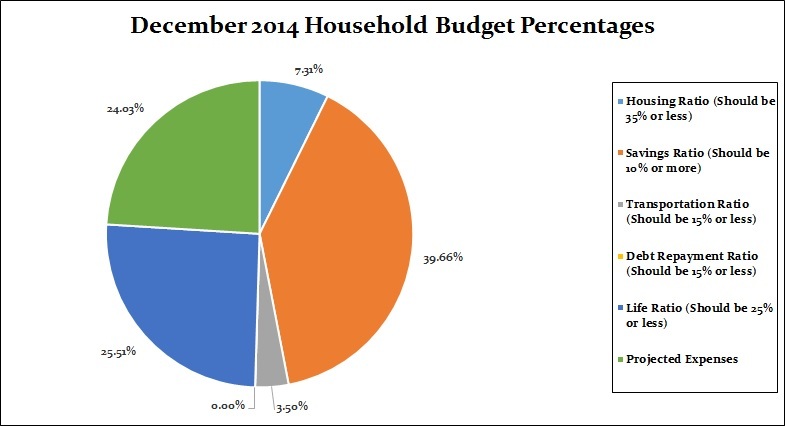 Usually you see this pie chart for every monthly budget update which gives us a break down of monthly expenses and compares them to the suggested percentages of expenditure. 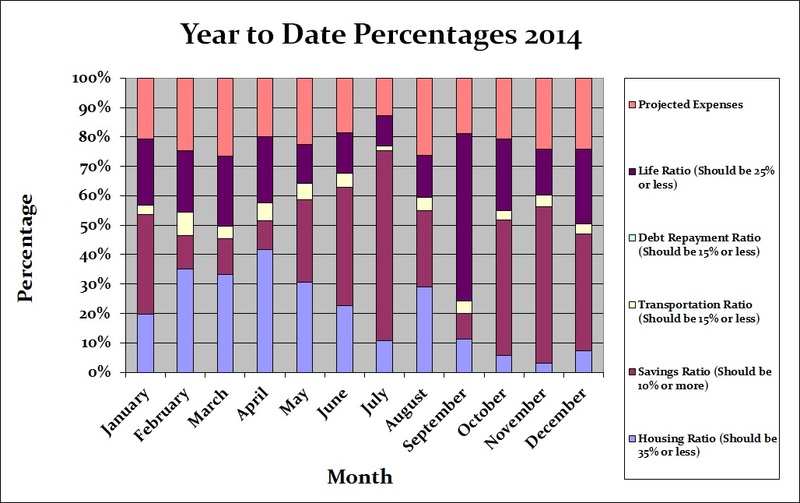 The pie chart above actually shows the entire 2014 year which takes into account good months and bad. 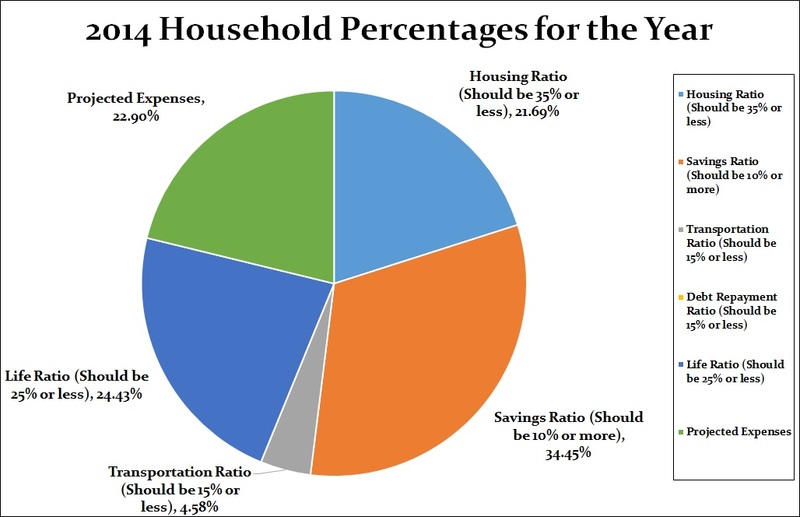 The yearly percentages are a little more true to our actual financial performance and give a great representation on how we did in 2014. Our housing ratio was lower than the prescribed 35% as we paid off the mortgage just before half way through the year. The various category gains eventually gave us an impressive 34.45% savings ratio which is way above the recommended 10%. If you scroll down you can see the actual numbers for each budget 2014 category. In December we really didn’t have anything unexpected except for the gas prices going down. That was a pleasant surprise. I think just about everyone in Ontario is loving the low costs of gas at the moment. My wife and I had to laugh because I haven’t seen them this low since I was dating my wife in 2006. I honestly never thought we would see them again but never say never I guess. Time to fill up the gas cans! This was after all meant to be our personal budget and although I would love to customize it for every fan that wants to use it but, I’m afraid I cannot. I’m not selling this budget or hope to make any money from it so enjoy this free budget and I hope that it works for you as much as it does for us. I often have fans ask me how to budget money and what we do in order to save so much money but the reply is that it’s not about the money it’s about the process involved. We are both money managers of our finance and with that relationship compatibility we have been able to get to where we are today, debt free. It doesn’t matter if you are using a cash only budget or you use your debit and credit cards, if your budget doesn’t balance you have budget issues you should review. Learning how to be your own money manager is important because no one else will care about your money more than you. We don’t always save as much money as we would like every month but most importantly we are not going into debt only because we are budgeting our money. In fact we are currently debt-free including the mortgage which means all we pay for is our monthly bills and expenses. One of the most important things we did for our personal finances was that we never let the budget deter us from reaching our goals. Sure we’ve had crap months but we made up for it or we learned from our mistakes just like anyone else would. Budget failure only occurs when you give up on your budget which should not happen as long as you truly want to reach your goals. Sometimes fans email and ask me if living on a budget in Canada is any different from living in other countries. To be honest I’m going to say, probably not. If I still lived in the UK I could use this exact budget spreadsheet to meet all of my needs however the budget needs to be reviewed monthly. 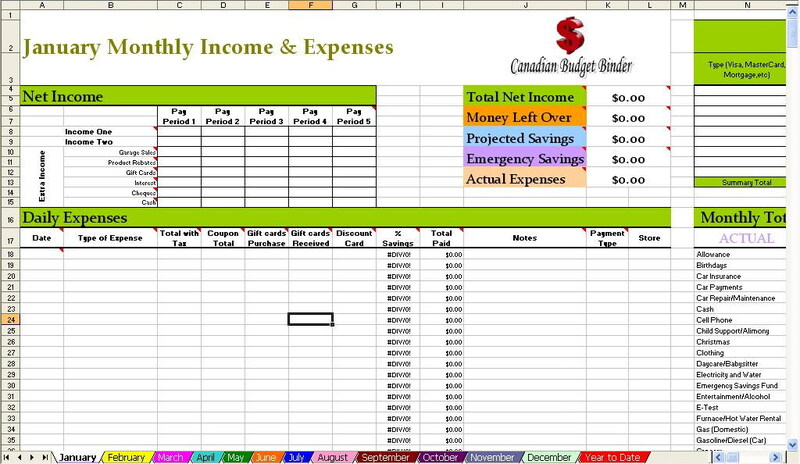 Below are links to the budgeting series which I wrote while designing our excel budget spreadsheet. Our savings of 39.66% includes savings and investments and emergency savings for this month. The last month of the year total spend comes to 100% which shows that we spent our income this month, invested extra and used the rest as emergency savings. Our Life Ratio which for this month was 25.51% and just slightly over the target percentage of 25%. Our projected expenses this month is at 24.03% which now includes some increases due to overspend explained in the 2013 year in review. Almost 7 years ago I started working in Canada making a bit over minimum wage and have since moved up the ladder. I’m now working very hard to secure my dream job with a foot in the door. We aren’t all lucky but if you do the best you can at least you can look back and say you gave it a shot. For now we will have to manually track which means month after month we add up what we save in each projected expense category and minus what we spend so we know how much we have and what is left in each category. I’ll be updating our personal excel budget spreadsheet for 2015. So the $1744.85 gets paid into the projected expense account every month no matter what. It seems to be easier to track our money this way but you can do what works best for you. This means we should have $600.00 per year for clothing to spend. We have to track that expense as we spend it manually but hopefully for our 2014 budget I can incorporate that into our spreadsheet so it tallies the numbers up as we go along. That way we will be able to know exactly what we’ve spent as an ongoing total. Below you will see two tables, one is our monthly budget and the other is our actual budget for the month of December 2014. This budget represents 2 adults and baby on the way plus all of our investments. These goals include family life goals and blog goals. 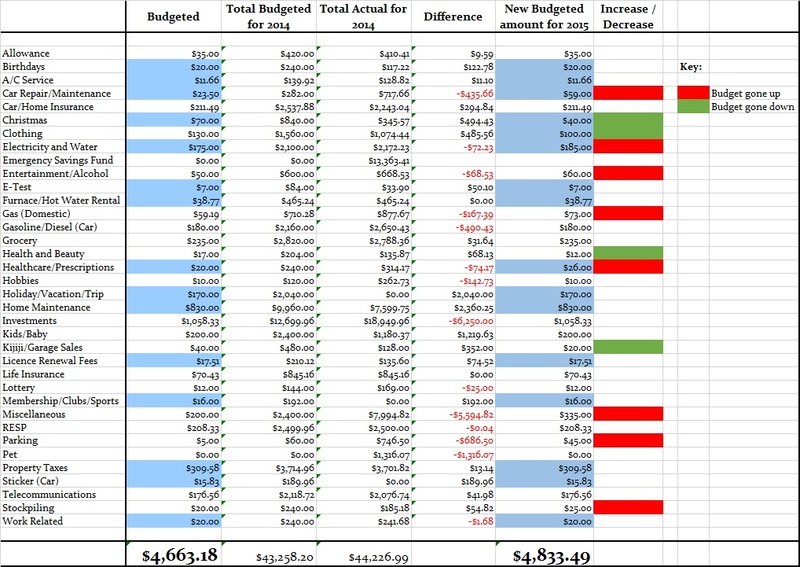 Complete projected expenses tracking sheet for budget (ongoing)- I’ve been working on this and hopefully will have it completed by month end since the new budget has started for 2015. Reach 3700 Twitter Followers- PASS 3753! Reach 6545 Facebook Followers- PASS 6553 (it’s been up and down all month) meh! Reach 1890 Pinterest Followers- PASS 1898! Reach 2675 Followers The Free Recipe Depot Facebook- PASS 2693! Read a chapter in my personal finance book- FAIL Horrible year for reading. Help a new blogger with a task or question- PASS Yes I did, a few actually. Connect with a new blogger- PASS I connected with quite a few new bloggers which is great as I enjoy branching out to meet others. Finish the bathroom shower- HUGE Fail but it’s on the agenda when I can slide it in. Buy a new blind for the garage- FAIL No time to get to the shops for this. I might wait until Spring 2015. Pretty much anything I failed above I’ll be working on in January. Reach 160 Followers Bloglovin- This is NEW!>>> Follow me HERE! In case you missed our budget updates from the start of the 2014 year… here they are. That’s all for this month check back at the beginning of February 2015 to see how we made out with our January 2015 budget! Follow Me on Social Media by clicking on the links below! Congrats on your budget goals and paying off the mortgage. Even though the bed hit your misc budget its a great investment in you. Good sleep is primary for good health. We paid off our mortgage in January 2014 and its the best thing I have done for my finances and peace of mind. We did struggle with the question: is it better to invest this money or pay off this low interest debt. But once it was paid I felt a huge relief. Thanks and yes the bed was a great investment only problem is when we go to the relatives or anywhere else we miss our bed lol. Congrats on paying off your mortgage too. I hopes it’s more of a trend for people rather than debt building. I second you on that relief. Phew! Great job this year! Paying off the mortgage is one of the things I desire to do, but know this won’t happen as quickly as I want it to. Reallocating those funds would be wonderful. Should you go the homemade route for baby food, it is absolutely awesome. We did that with my son and I wouldn’t have it any other way. Sometimes it was more expensive and less convenient when meat was added in, but frankly, it never occurred to me to open a jar of bananas when mashing it is really easier in the long run. And, we got really good at timing outings with the food with just the right amount of cool temperatures that frozen cubes would be melted and ready to go when we were and little or no heating necessary (which we carried a thermos of hot water regardless). And, we had the opportunity to add in simple spices in his life early on, so we never adjusted our cooking for a child, we got him to eat what we were eating. When he ate off of our plate, it was exactly what was in front of him, Aside from the discover of allergies we would have discovered regardless, it was a pretty simple process. We are so lucky that he has turned out to not be a picky eater, but frankly prefers variety. Good luck with the monthly goals. I can’t get myself to do a list monthly, but annually, I’m set for this year. Financial goals, I only have one – spend as little as I can that’s not mine while I’m in school. That’s it. It may be near impossible, but I’m going to try. We are going to do homemade baby food and you would like to contribute your experience to the blog post email me and we can talk. Another fan has also helped me with this post and I’m excited to put it all together. A mattress is one thing I did not cheap out on either as mine cost roughly $2500. I believe it is money well spent as you cannot put a value on a good night’s sleep. Also if you’re looking to sell your home gym now after you start going to the Y let me know! Thanks for being so open with your budget, helps us all make improvement in our own budgets. No they aren’t cheap. Some mattresses we saw were upwards of $7000 plus.. it was crazy but a good nights sleep is worth it. You know that being less that $1,000.00 in the red isn’t that bad and 2015 has created a clean slate. Because of following your blogs, I’ve created a PE category into my budget and have added items throughout the year as needed. I have changed on how I’m recording my purchases for 2015 as an experiment to see if this makes things easier for me to follow. It doesn’t change the amount of money I’m spending but it will give me a better picture on where I’m spending that money and hopefully be able to make better decisions going forward. That’s a good way of putting it, one piece ha. You WILL see a big difference if you record all of your expenses and budget. My oh my it will the best thing for your finances if you get through that in once piece and you know what, it’s dead easy to do. Don’t give up. Wow, great job on keeping track of everything. Coming into January is my first time ever setting up a budget, mine is very elementary compared to what you two are able to accomplish. Maybe one day I will have enough willpower to keep track of where the money goes. I know over the last 5 years there has been many times where the Mrs. and I are sitting down thinking “Where did all of our money go?”. Great job on the success, and good luck meeting all of those 2015 goals. We were like that years ago but once we started tracking our money we never looked back and now we are financially happier than ever. Best of luck to you Jeff!